3 bedrooms | 2.5 baths | Open first level-2640 SQ. FT. The living room takes center stage on the first floor of the Braddock. The large, open-concept space, with wood floors, and a stunning kitchen is perfect for entertaining. The covered sitting porch is a spot for rocking chairs and a cool iced tea, watching town parades passing by. On warm summer nights, have dinner al fresco in the available courtyard. The second floor of the Braddock may be tailored to the owner’s needs. Add an optional wet bar in the sitting room adjacent to the owner’s suite; a gas fireplace may also be installed. Choose the ideal owner’s suite for your morning routine. Like all models in the community, the home is built to be highly energy efficient and includes nine-foot ceilings on the main level, and a one car garage. Offered at $599,990. 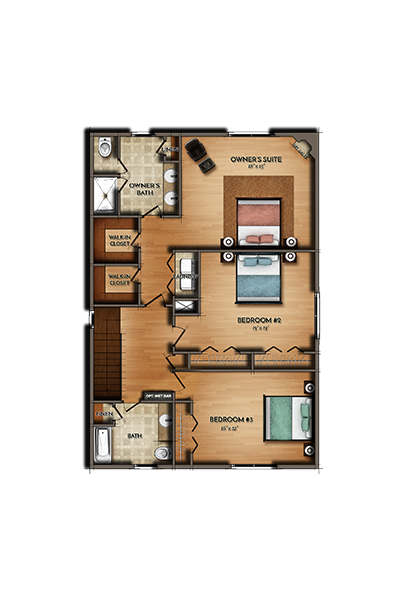 Click floor plan for more detailed view. Get more information about this exciting new-construction development. Be the first to know about new models and community events. Gain exclusive access to model photos and more.